Ernesto Valverde has picked his squad for Sunday’s visit to Real Sociedad, with Rafinha and Gerard Deulofeu being left out along with the injured Samuel Umtiti, Paco Alcácer and Philippe Coutinho. Nelson Semedo was added to the list of absentees when he was diagnosed with tonsilitis on Sunday morning. 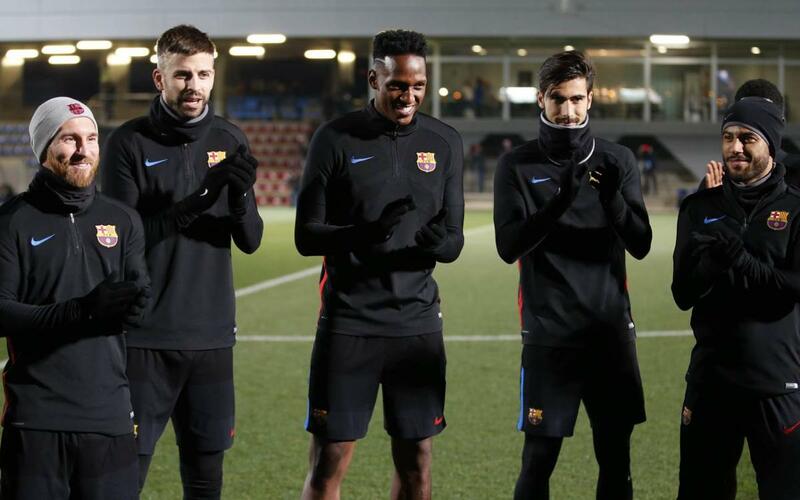 On Saturday evening, the Barça first team gathered one last time on the Tito Vilanova field for a session that also included new signing Yerry Mina, just a few hours after the new signing had been officially unveiled to the Camp Nou. But the Colombian will not be in the party travelling to San Sebastian either, which is as follows: Ter Stegen, Aleix Vidal, Piqué, Rakitic, Sergio Busquets, Denis Suárez, Iniesta, Luis Suárez, Messi, Dembélé, Cillessen, Mascherano, Paulinho, Jordi Alba, Digne, Sergi Roberto, André Gomes and Vermaelen. The team will be flying to the Basque Country on the morning of the match, which kicks off at Anoeta at 8.45pm CET. Carles Aleñá and goalkeeper Alberto Varo of Barça B were also involved in the workout.